By Lisa Callaghan, Judith Haines, Valerie Harding, Ceinwen Partridge, Sonia Sloan and Liane Small. 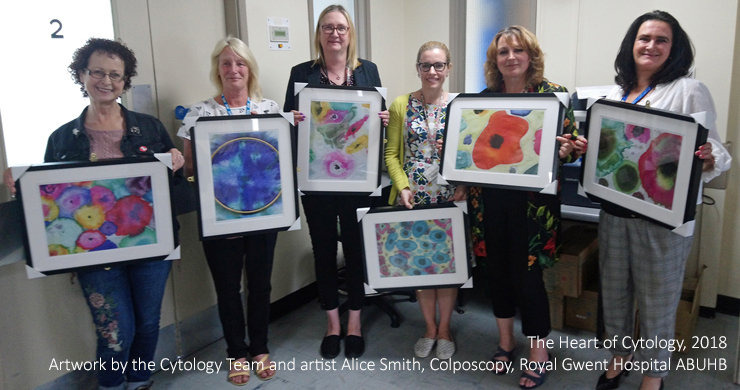 On Friday 21st September, members of the Cytology team visited Colposcopy to see their artwork on display. In Spring 2018, members of the Cytology Screening team met for 12 weekly creative workshops, led by artist and facilitator, Alice Smith. Together the team explored mosaic making and silk painting. The imagery in the work on display is reminiscent of the cells and organisms they observed daily in their laboratory roles. Much of this work will now be undertaken by molecular testing. The images on display have been direct scanned and enlarged to show the details and colours. The artwork which includes privacy screening has been welcomed by the Colposcopy team in their new home on B7 East. The project was initiated by Jill Evans of OD and supported by Sarah Goodey who worked closely with Sonia Sloan. The project has had many outcomes and we will be sharing an evaluation document shortly. Images from the project will be on display at the ABUHB Therapies and Health Science Conference in October 2018. With thanks to Sonia Sloan & the Cytology Team, Jill Evans, Alice Smith, Sara Warshawski, Claire Adams & the Colposcopy Team, and Works & Estates. This project has been delivered by Gwent Arts in Health, and funded by ABUHB Charitable Funds and Cervical Screening Wales.